BITCOIN’S staggering bull run through 2017 stunned investors and crypto traders alike, giving birth to the cryptocurrency craze. But a shocking theory has emerged to suggest bitcoin’s meteoric rise was foretold by the famed mystic Nostradamus. Michel de Nostredame, a 16th century French apothecary and prophet, is believed by many to have correctly predicted the rise of Adolf Hitler, the 1666 Great Fire of London and the future outbreak of World War 3. 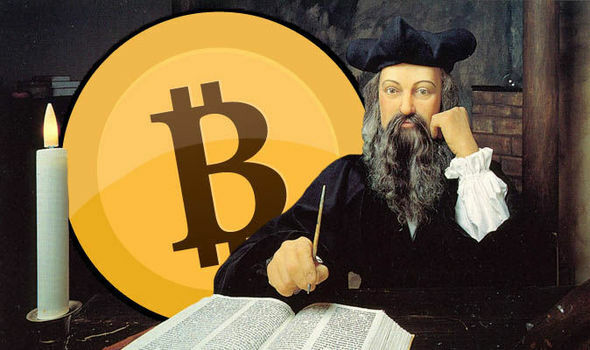 Now in the wake of bitcoin’s incredible success story, some conspiracy ‘truthers’ are suspecting that Nostradamus knew about the bitcoin boom all this time. But did the legendary mystic really predict the rise of bitcoin? Reddit user Viper2087 thinks that is the case. The forum user shared his thoughts online: “Ok, that may be a bit of a stretch but honestly, check THIS OUT! “Alas, how we will see a great nation sorely troubled and the holy law in utter ruin. Christianity (governed) throughout by other laws, when a new source of gold and silver is discovered. “Through lightning in the arch gold and silver melted, Of two captives one will eat the other: The greatest one of the city stretched out, When submerged the fleet will swim. The cryptic passages, known as quatrains, supposedly come from the bulk of Nostradamus’ predictions written in the 16th century. His magnum opus, the 1555 Les Propheties, is widely considered to be the foremost authority on prophecies and predictions. Conspirators now think that the book may contain hints and clues about the mysterious creation of bitcoin. Bitcoin emerged in 2009 as a direct challenge to Wall Street in the disastrous aftermath of the 2008 financial crisis. The digital token’s creator, or group of creators, remains an anonymous figure shrouded in shadow known online only as Satoshi Nakamoto.But one conspiracist thinks he may have found a link between Nostradamus and Satoshi in one very specific quatrain. Gritbits wrote on Reddit: “Born in the shadows and during a dark day, He will be sovereign in realm and goodness: He will cause his blood to rise again in the ancient urn, Renewing the age of gold for that of brass. Purveyors of the hogwash theory also point to more passages referencing gold and silver. Viper2087 wrote: “The great credit of gold and abundance of silver will cause honour to be blinded by lust; the offence of the adulterer will become known, which will occur to his great dishonour. “The copies of gold and silver inflated, which after the theft were thrown into the lake, at the discovery that all is exhausted and dissipated by the debt. All scrips and bonds will be wiped out. Conspiracy enthusiast who religiously follow Nostradamus’ works are convinced the man had mythical powers of comprehension, but there is very little proof if any to support the idea. Brian Dunning, science writer and creator of the Skeptoid Podcast, is certain that Nostradamus’ words have fallen victim to often deliberate misinterpretations and false translations. He said on his podcast: “Nostradamus’ writings are exploited in a number of fallacious ways. All of Nostradamus’ critics agree that the French prophet’s predictions rarely come to pass, and those that do, require a good deal of hindsight to loosely connect the dots.